What is the first thing that you think of when Spring rolls around? Are you excited to get back out onto the beautiful trails on the parkway? Or just ready to spend some time outside relaxing? Gardening has always seemed to be a huge spring hobby and is a great way to spend some time outdoors. It also gives you the chance to grow your own food, as well as bring some color back into the world after the cold winter months. Although gardening seems like such a simple task, there are so many ways to improve your garden and make sure your plants are protected! There are countless ways that your garden may be compromised by the outside world. Spring in the high country definitely comes with a few days that still feel like Winter which has the potential to kill your plants. There are also various pests that may try to make their way in and use your garden as their lunch. For each conflict that could arise in your garden, there are 10 more ways to prevent it. If you have gardened in the past, you have probably used a chemical pesticide to protect your plants. Instead of this, you should try a homemade garden insect spray like the one below. 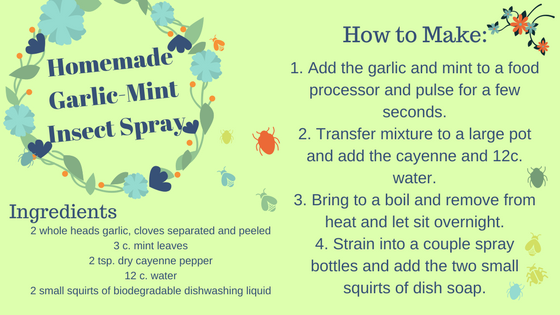 This Garlic-Mint spray is easy to make and is made of natural ingredients like garlic, mint, and cayenne pepper! Another way to ensure that unwanted pests are not running all over your garden is to plant naturally pest repelling plants. Not only will these help to keep the pests away, but they will also give your garden a nice pop of color. Some great flowers that will do the trick are Marigolds, Petunias, and Lavender (see bottom for tips on growing beautiful Lavender). You can visit this helpful website for even more pest repelling plants and other gardening tips. Soil is the foundation of everything that goes into your garden, so it is important to make it the healthiest it can be. Having good soil gives your plants a better chance of looking their best. One way to improve your soil is adding leaves to your garden. Leaves are full of minerals so they can feed earthworms and increase the nutrients in the soil and also lighten up heavy soils. Another thing to add into you soil is your old kitchen scraps. Your scraps from the kitchen hold a ton of nutrients that will help your plants grow. Along with spring gardening comes spring cleaning! See this blog for tips and tricks to creating a clean an organized home.